The transformation of vibrations into electric energy through the use of piezoelectric devices is an exciting and rapidly developing area of research with a widening range of applications constantly materialising. 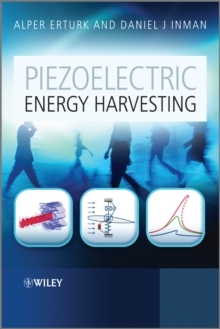 With Piezoelectric Energy Harvesting, world-leading researchers provide a timely and comprehensive coverage of the electromechanical modelling and applications of piezoelectric energy harvesters. They present principal modelling approaches, synthesizing fundamental material related to mechanical, aerospace, civil, electrical and materials engineering disciplines for vibration-based energy harvesting using piezoelectric transduction. Piezoelectric Energy Harvesting provides the first comprehensive treatment of distributed-parameter electromechanical modelling for piezoelectric energy harvesting with extensive case studies including experimental validations, and is the first book to address modelling of various forms of excitation in piezoelectric energy harvesting, ranging from airflow excitation to moving loads, thus ensuring its relevance to engineers in fields as disparate as aerospace engineering and civil engineering. Coverage includes: * Analytical and approximate analytical distributed-parameter electromechanical models with illustrative theoretical case studies as well as extensive experimental validations * Several problems of piezoelectric energy harvesting ranging from simple harmonic excitation to random vibrations * Details of introducing and modelling piezoelectric coupling for various problems * Modelling and exploiting nonlinear dynamics for performance enhancement, supported with experimental verifications * Applications ranging from moving load excitation of slender bridges to airflow excitation of aeroelastic sections * A review of standard nonlinear energy harvesting circuits with modelling aspects.